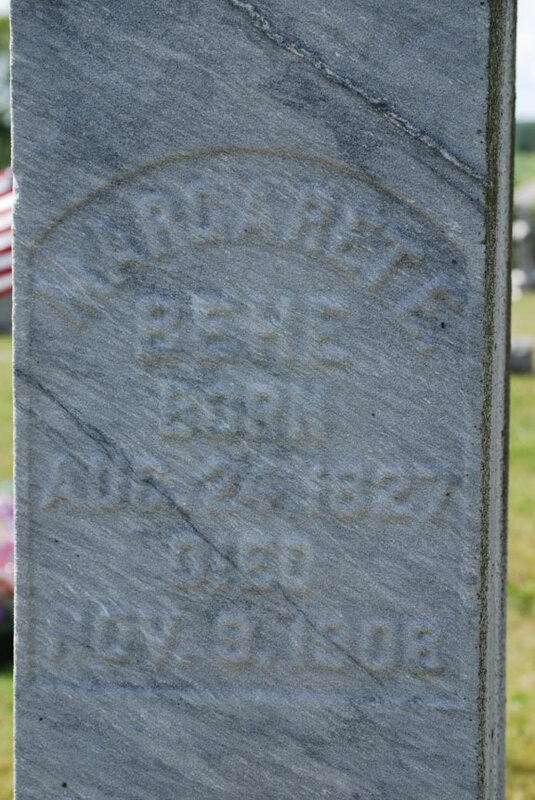 John Behe was the third son on Mathias and Catherine, born in 1824 in Loretto. He married Margaret McVey, and the two raised nine children on a farm in St. Augustine, a small town a few miles north of Loretto. They were respected members of the church and the community. John operated a sawmill on the farm, which was located in a valley just below the church. The photo on the left shows the sawmill; on the hill in the distance is St. Augustine’s Church. 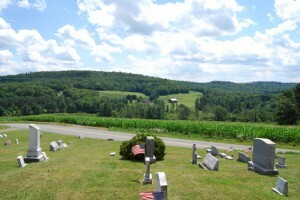 The one on the right, taken in 2008 from the church grounds, shows the area where the farm was located. These photos were taken on the farm circa 1902. Mr. and Mrs. John Behe of St. Augustine, Pa., celebrated their golden wedding on Sunday morning last in St. Augustine’s Church. Mass was celebrated by Rev. Father P. Quinn, and the happy old couple were the recipients of the hearty congratulations of the congregation after the mass. Mr. Behe and Miss Margaret McVey were married in the old Church of St. Michael, Loretto, on February 21, 1854, by Rev. Joseph Gallagher, a cousin of the bride. James Phelan and Cecil Conrad, the latter of whom is still living, acted as the witnesses. Ten children blessed this happy union, nine of whom are still living, Mrs. Dr. J. C. McMullin of San Antonio, Florida; Mrs. Robert Barr, McKeesport, Pa.; Mrs. Donahoe of St. Augustine; James and John, Altoona; Edward of Allegheny; Joseph and Rose, at home, and Sister Perpetua of the Charity Order. Mr. and Mrs. Behe have lived near St. Augustine since their marriage. Although advanced in years, they still retain their jovial dispositions, so familiar to all who come in contact with them. John Behe obituary from the Johnstown Tribune. John Behe, one of the most widely known and generally esteemed citizens of Northern Cambria, died at his home near St. Augustine, Tuesday, October 17, 1905, aged 82 years. 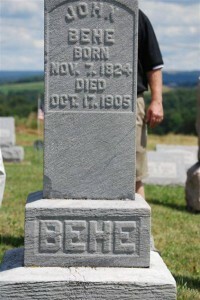 Mr. Behe was born near Loretto November 7, 1824, and was the eldest son of Mathias and Catherine Kaylor Behe. About two years ago Mr. and Mrs. Behe celebrated the anniversary of their golden wedding. Besides his aged wife, the following children survive him: Mrs. Dr. McMullen, San Antonio, Fla.; Mrs. Robert Barr, McKeesport; James, John and Joseph, of Altoona; Edward, of Allegheny; Mrs. Maggie Donahoe, St. Augustine, Pa.; Sister Perpetua, of St. Kieran’s convent, Pittsburgh, and Rose, at home. Mr. Behe was a faithful member of the Church. His funeral took place on Friday morning from St. Augustine’s church. 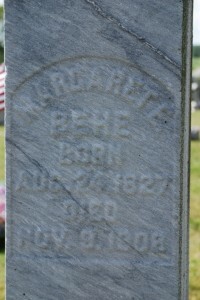 John passed away in 1905, Margaret in 1908. They are buried in adjoining plots in the St. Augustine Cemetery behind the church, overlooking their farm.